Around a year or so ago, a chat popped up on my screen from Guy Kewney. “…Thought you ought to know, I’m pretty ill…” and a link to his personal blog where he’s been writing about it. Every couple of weeks since, I’ve visited his blog to read his increasingly graphic descriptions of dying from Cancer. It hasn’t been pleasant, but it’s been an eye opener. He wrote about the last months of his life in merciless detail, amazing truth, incredible bravery and wit. Guy was of course, an author – it was how he made his living, being ‘Editorial Fellow’ (a title he chose himself) for Ziff Davies’ Personal Computer World Magazine, Editor of PC Dealer and many others. There was nobody in the high tech world Guy didn’t know. As John Lettice co-‘Editorial Fellow’ and friend writes, “I remember an awe-struck staffer returning from a visit to Guy’s terraced house in Hackney, babbling that he didn’t have any carpets but that he did have his own PBX system, which in 1983 was non-trivial . . . and not a lot of IT writers were chums with the late Douglas Adams, author of the “Hitchiker’s Guide” either! Guy and I met when we made some videos together. Truth to tell, I was a tad envious of his encyclopaedic knowledge of modern technology; and of course, he knew everybody of any importance and what’s more, they knew him. One of my personal recollections was Guy telling me about a system he’d had a preview of, that would allow you to put your whole music collection on a single CD. He said “This will change the world of music”. He was talking about MP3s of course – and he was right. Listening to Guy was always a pleasure and if I had a pound for every time I’ve quoted him, I’d be able to buy that new Superphone I want! Guy died a few days ago. I asked Colin Grimshaw, Media Director at Imperial College where we made the videos, to look out a couple and we’ve put them on YouTube. The only videos on YouTube featuring Guy’s name were from the famous incident when the BBC interviewed a Taxi Driver, believing he was Guy – and that’s not fair at all. 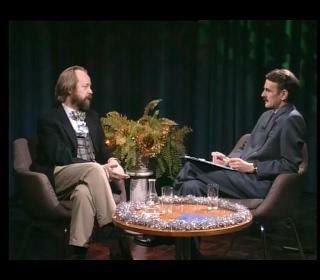 Guy, interviewed just before Christmas 1997 – 2 years before Y2K. Rest in Peace Guy and sincere condolences to Mary, his wife and Lucy, his daughter.